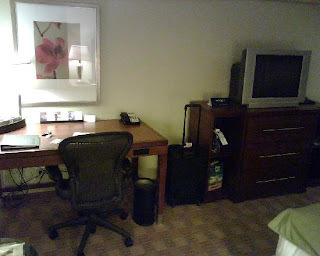 I recently stayed at the Hyatt Regency Long Island for 2 nights on business. The hotel grounds and building are very nice. The rooms are very nice sized, fairly well maintained and the beds are comfortable. The climate control works very well and the windows open which I really enjoy, it makes you feel a little less claustrophobic to get some fresh air. The bathrooms are a nice size and it has a good shower with good pressure. The gyms is nice with new equipment, however no A/C which nice when its 90 outside. They have starbucks in the lobby for breakfast which is nice. I used room service during my stay and the food was very good and service was prompt and the food was pretty good. - Internet didn't work in the first room I was in and I had to be moved. Internet is WiFi and fairly dated and slowed. Hotels need to realize that WiFi no longer qualifies as ground breaking technology and is a necessity for business travelers. - Maid service was poor, doing little more then make up the bed, they didn't replace the coffee, empty the trash or vacuum. - There is a bizarre lack of coffee mugs in the hotel. The cups in the room are paper and even when I ordered a pot of coffee from room service, the cups with the pot were paper. Honestly cut be a break you simply cant be that cheap. Overall, compared with other hotels in the area I would probably return but for Hyatt this ranks as an average stay, nothing special. 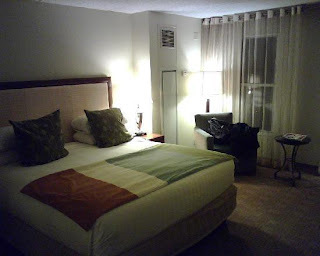 They do benefit from being the only 4 star hotel on Long Island New York. wow!! !lovely and chic place to stay!!! i don't like the paper cups...in 2 or 3 star hotels, they don't even have paper cups!hehehe. but the bed looks cozy though!